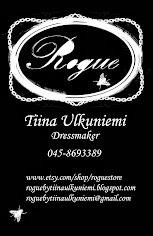 Rogue by Tiina Ulkuniemi: One of a kind. Yesterday I went for a walk with mister grumpy in Tampere Arboretum park that is very near to our apartment. I did not know that this place even existed. I took this chance to take some pictures of this one of a kind dress that I made last monday. I really love this fabric. The print is awesome on my opinion. The shades of grey almost look metallic. Good thing I still have small piece of it so that I'm able to do a top out of it. So let me be clear. I have only this one dress and I will not be able to a second one since I'm not able to get more of this fabric. So grab this chance to get one of my one of a kind items.